The new type of regenerative heat exchangers, the so-called Pebble-Heater with radial fluid flow, is presented. The given mathematical modelling, as well as experiment al and industrial experiences have shown some extra ordinary characteristics of that facility, such as: high recuperation efficiency (up to 98%), stable hot gas (product) temperature, lowexergy losses (i.e. 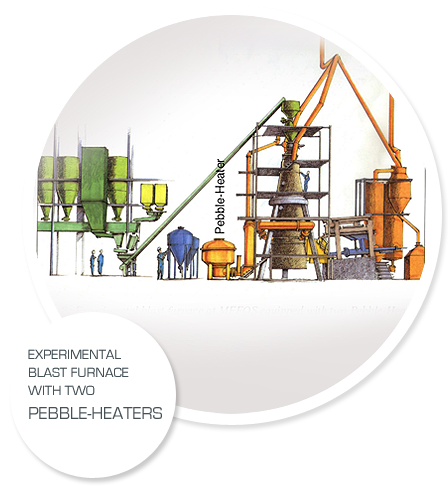 low temperature difference - aslittle as 20 K - between heating and heated gas), high temperature gradient inside the pebble-bed (2000 K/m), hot gas(product) temperature of up to 1500°C and at last not the least low investment costs compared to the state of the art. Some applications in the metallurgy have been briefly presented, such as: hot blast supply for blast furnace and other shaft furnaces, post combustion in steel converters, scrap melting with fossil fuels, regenerative burner systems and off-gas cleaning through thermal oxidation. The new regenerative heat exchanger is referred to as "Pebbl e-Heater" - a name already known in technical practice. It is filled with bulk material consisting of spherical pebbles and may operate at high temperatures to heat and cool gaseous media. From that point on there are no further similarities to any known design of a Pebble-Heater. The differences start with the flow direction: the fluid flows radially through the pebble-bed which is fixed between two concentric, permeable cylinders, referred to as hot and cold grid. All other extraordinary characteristics result from that difference which only appears insignificant at first sight. Higher flow velocity and/or smaller pebble diameters may be used, as there is no danger of fluidization. That provides a very high specific surface (or surface to volume ratio) and consequently an excellent heat transfer. A thermal efficiency of 95 % is easily achieved (without any additional off-gas recuperation for preheating combustion air or gas ). A unit with a recuperation rate of over 98% is already in operation. In addition, those results are achieved at small exergy losses, i.e. with low temperature difference (as little as 20 K) be tween heating and heated gas. Moreover, all that takes place at temperatures of up to 1500°C.